When it’s time to start writing your code, Script Debugger is there for you with a superior integrated development environment. Even our new “lite” mode is a huge step up from working in Apple’s Script Editor. The enormous range of tools available in our full application will revolutionize your coding experience. Get ready for maximum productivity when you write scripts easily and quickly with our powerful and flexible code creation features. 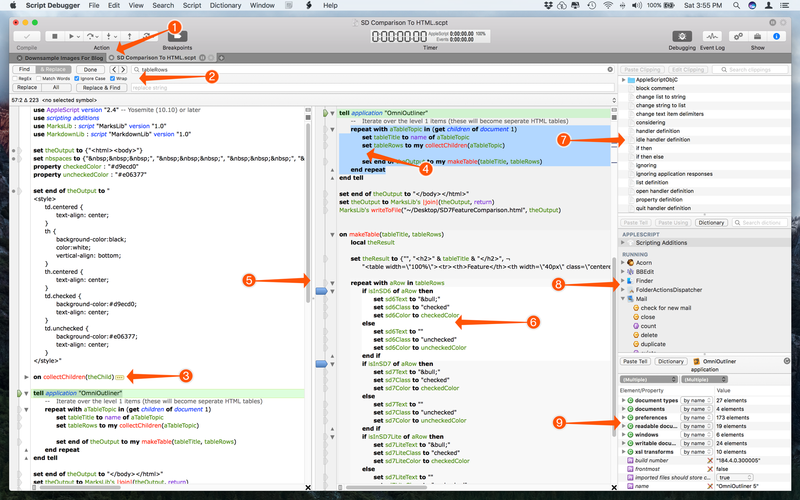 Script Debugger helps you by intelligently inserting a broad range of commonly-used code segments. You can insert tell blocks for applications and objects or properties. And our “clippings” and text substitution features intelligently insert code such as AppleScript constructs (repeat loops etc.) or application commands (including parameters). These features are specifically designed for the peculiarities of the AppleScript language. They let you easily navigate large scripts, automatically enter “end” lines and closing delimiters, and more. Easily work with multiple documents at once. Powerful find and replace with Regular Expressions. Collapse parts of your script to focus on your work. Select AppleScript blocks with a single command. Split the editing window vertically or horizontally to view different sections of your script at the same time. See where AppleScript blocks begin and end by hovering mouse in the margin. Insert code by double-clicking clippings. Get application dictionary information without leaving the editor. Explore applications right from the editor. Context follows you as you edit.